Tschoop’s death in 1746 came about due to an epidemic often common and tragic to Native American communities. Tschoop’s life was taken along the lives of several children and several of his friends as a consequence of the introduction of small pox to the Moravian-Indians communities he was so closely associated with. Tschoop’s death was preceded by the deaths of several very young Mahican children, for whom no cause for deaths was initially assigned in early summer 1746. By July 1746, one of the first deaths that could be attributed to small pox was noted for the community of brethrens Tschoop was then associating with. Soon, other brethrens became ill with this deadly illness. Throughout this time, the personal relationships Tschoop had with his associates underwent minimal change. Tschoop’s final periods of illness were witnessed by several of his close associates, individual who themselves might have caught the same illness through such personal interactions with their spiritual leader. Tschoop’ s death may have been due to smallpox, but his spiritual route and experience were driven by yet another illness or medial condition he suffered during the latter years of his life. This illness or condition could have simply have been just what the missionaries described it to be. The result of Tschoop’s malevolence and ignorance of “truths” regarding healthy living patterns, such as a self-induced intoxication by rum, wines, and other colonial-manufactured inebrients. A review of the descriptions of Tschoop’s experiences suggests that there was much more to his physical state than anything produced just by alcohol and some malingering injuries. The details of Tschoop’s appearances tell us he had a chronic disease state, possibly impacting his mobility and ability to engage in many of the normal day-to-day living activities. Descriptions of Tschoop’s medical condition appear in numerous places in the literature on Shekomeko history. Many of these descriptions are brief, and at times, victims of change by the literary artists that helped to define them. Due to this literary freedom, the content, meaning and interpretation of these descriptions of Tschoop do not immediately raise flags. Most researchers would read them and take them to be something like an overcritical attempt of the writer to appease his readers. Such an interpretation is in fact very far from the truth–the flags that point out Tschoop’s medical condition are there. The author’s choice of words “crippled himself in the service of Satan” suggests Tschoop and his people were somehow engaged in something not favored by most, especially those at the receiving end. His crippling condition could have been due to a raid on a local farmstead or some nearby tribe the Mahicans were constantly fighting with for resources. It could have been due to something as simple as an impacted arrowhead in the leg or lower back or the results of falling down steep terrain during the attack and retreat. Whatever the reason, this problem at times seemed to cripple Tschoop to such an extent that he could no longer stand erect on his feet for long periods of time, and often was forced to lie some place in recluse until the pains and other symptoms subsided. With time, we could tell this condition was getting worse, not stabilizing or getting better, as would happen with the healing of a hairline fracture or the result of the body’s attempts to deal with a significant change in posture and the related lumbago. In one part of his story he is noted to be lying down in intense pain and agony. In another, he is forced to remain in Shekomeko while others travel to Bethlehem for their baptisms. This could be the results of injury and back pain, and even prolonged swelling with infections setting in, but due to the way Tschoop’s condition has progressed, it appears to be more. 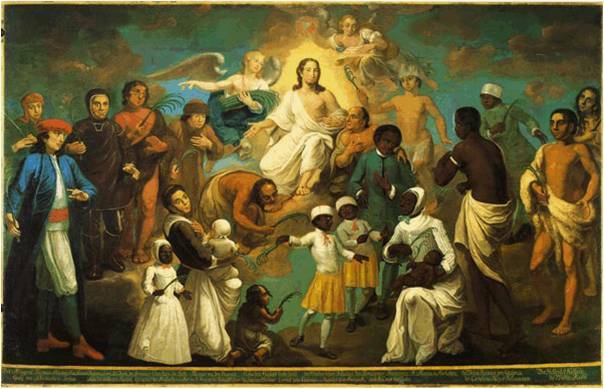 If we take a close look at the renderings of Tschoop that appear in paintings by John Valentine Haidt, we first notice an Indian who is seated by the side of Jesus. Unlike the other Indians in this painting he is husky in appearance, with a somewhat heavy upper arm. ‘An Indian of considerable weight no doubt’ is what some viewers might say. In fact Tschoop’s weight problem went hand in hand with his other medical problem, which is the focus of this essay. This medical condition played an important role in the decisions Tschoop made as a sachem or chieftain. It also facilitated the process of the conversion of Tschoop to Christianity, an effect of disease that erupts due to the psychology of a condition as it becomes increasingly disabling. So in a way, the baptism and Christianization of Tschoop by the missionaries represents, in part, a rebirth of Tschoop in a spiritual sense. 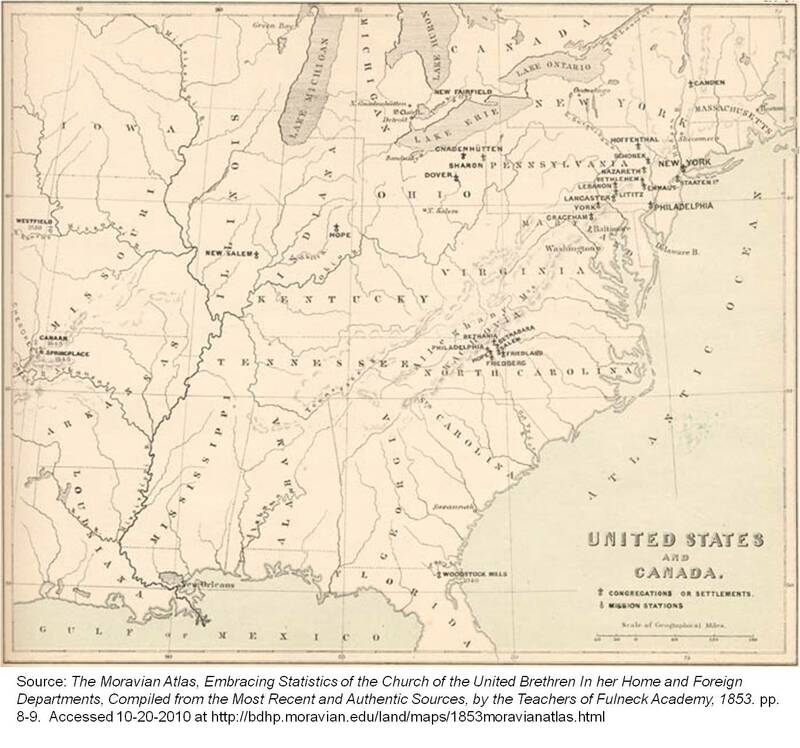 It not only perpetuated Tschoop’s ongoing role in his traditional social setting, it also resulted in the avenue that each side of this missionary setting had to take to survive a while longer than the local sociocultural changes might typically allow due to the migrations. What was the exact cause for Tschoop’s physical state? Was there a particular disease that Tschoop had, which at the time of the missionary work and paintings, even someone trained in medicine by the best university in Europe would not be able to diagnose accurately? To many writers and artists associated with the missions at the time, this disease that Tschoop experienced was more a symbol of their own cause that they were writing about. They did not care what it was due to. They were more interested just in the fact that it existed. To the writers and artists, this disease was not the subject of any truthful retelling of Tschoop’s life as an important anthropological story. Retelling and redefining it became more a method by which Tschoop’s personality could be judged and categorized by missionaries retelling this story. Tschoop had an illness of course, but to the writers and artists on the Moravian side of this story, Tschoop’s illness served more as a metaphor that became very symbolic of the nature of how the missionary process works. With regards to his own people, Tschoop seemed to the Missionaries to be of limited importance due to his physical state, but he was in fact still their leader or chieftain. Tschoop was a leader that the missionaries still had to contend with throughout their attempts to “train” and convert these “barbarians.” Once more, as the details about Tschoop’s condition began to be realized by the missionaries, and Tschoop’s own personal reactions to its debilitating state surfaced, the medical condition became the golden opportunity the missionaries were waiting for. This led the mission to make a strong statement to Natives about the meaning and purpose of their missionary encounters, as indicated by its effect upon sachem Tschoop and in due time, how it might also the shaman and medicine man of these Mahicans, Shabash. To his own people, this underlying meaning and purpose of Tschoop’s disease was different. This made the missionary leaders more eager to understand the barriers that existed between them and the Natives. As they tried to learn the language of the Mahicans, they forgot about the importance of the leaders on these people, in helping them to focus upon their own spiritual practices. To missionary workers, one possible opinion this led them to conclude about Tschoop’s condition was that his medical condition was merely a result of him taking the wrong path in life with his people. Although wrong in making this assumption, it helped them to develop and write down their on personal conclusions about Tschoop’s role, purpose, meaning and value to the other Shekomeko Mahicans, descriptions which were later published were fairly misleading, if not completely incorrect. When we review the Moravian writings about Mahican Indians, we first have to ask ‘Is all of what the missionary writers said about the Mahicans and Tschoop true?’ Was Tschoop simply an alcoholic like Rauch suggests? Was he a crippled old man? To the missions he would become a future member of the church’s brethren, someone in need of social acceptance and counseling. In a mixed traditional sense, Tschoop was becoming ‘an elder in need of their wisdom’? The first and foremost evidence that there was some sort of illness suffered by Tschoop is found in the above painting by John Valentine Haidt. In this painting we can see all of Tschoop’s body, and note that Tschoop is unable to seat himself next to the Savior Jesus with a straight back and erect posture. By no means was this depiction of Tschoop’s posture unintentional. John Valentine Haidt knew all about Tschoop’s medical condition, and like others made little to no mention of it in any written materials he might have produced. What Haidt he was doing when he gave Tschoop his less than noble appearance, for comparison with the other Natives depicted in this painting, was that he also gave Tschoop the prime location for salvation. He seated him immediately alongside Jesus on His left side. 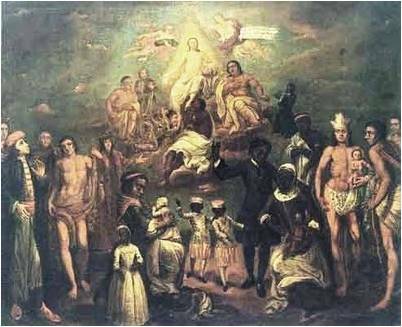 All of the other aborigines and Indians depicted in this painting, also products of Moravian salvation, were all standing around and about Tschoop and Jesus. This placement of Tschoop is in part due to the chronology of the Moravian missions in North America. The person in charge of these missions, Count Zinzendorf, felt that these Native American groups in general, surviving in the outskirts of the New World’s wilderness, best represented the original intent and success of his missions. As a result, in some of the paintings there is also a third Indian situated very close to Jesus, on his right side, kissing His feet. Some historians identify this individual as a local Huron Indian converted to Christianity. Based upon the activities and roles of the missions in the Pennsylvania setting where these paintings were produced, this individual was either Huron, Mohawk or another fairly local Native group residing in the wilderness. In a 1983 conference in Oneonta on the writings of James Fenimore Cooper’s tale The Last of the Mohicans, details about Tschoop’s appearance were briefly discussed. Not as any example of a medical condition, but rather as part of a discussion on Mahican (Mohican) culture and settlers. In this discussion, the paintings of Haidt were one of the main topics, with a focus on identifying the 21 individuals depicted in these paintings. The identification of all 21 of these natives was never completely accomplished, and any comments about Tschoop’s medical state were never made. What was provided instead at this conference was a more detailed view of Tschoop’s bodily appearance or physical state. When one looks at the enlargement of a section this painting with Tschoop, ( the author produced this from a black and white dot image), all of Tschoop’s body is seen, just as it appeared when the painting was first made. Tschoop’s front is completely exposed to the original painter as well as to the viewer. His disabling medical state becomes unquestionable. This fairly crude black and white image clearly shows us a body with a deformation of the left and possibly right hip. A look at Tschoop should also tell us that he had a somewhat husky build, or perhaps a little bit more. His right hand held across his chest is not only bearing his slightly chunky and perhaps longer than normal fingers, but the joints appear to be slightly crooked in appearance, as if they were broken and subsequently were re-healed wrong. Tschoop is holding his hand as if it is partially non-functioning, or as if he had some sort of elblow injury ot pain limiting his range of motion. The arm is in an awkward state, held as if it couldn’t be laid upon his lap. This position would have been held by someone posing for this painting for approximately 15 to 30 minutes. Could Tschoop have posed in such a way for so long? This led me to the suspicion that this arm and joint deformation was a consequence of joint inflammation, such as that accompanying a severe form of arthritis. This is no doubt the result of a decision made by the painter to depict Tschoop’s appearance in a truthful form, had mellowed somewhat based on the facial expressions of his models. Still, they remain much truthful in appearance, nature and symbolic meaning. Since John Valentine Haidt resided in Bethlehem, Pennsylvania, he would have been present during at least one if not all of the times that Tschoop visited this town to preach his response to his conversion to Christianity to others. Since others could witness Tschoop’s work in the streets, like Conrad Weisner during one of his travels through this town, so could Haidt. It is assumed here that Haidt’s rendering of Tschoop is more real and personal in nature than any of the other renderings of aborigines and natives he provided in these paintings. Tschoop’s cameo is the most realistic of all the cameos included in this painting. Tschoop’s debilitated state is unquestionable, based upon the paintings. b) at midlife age (Measles? ), resulting in the development of a series of long term complications (arthritis) resembling those depicted in the paintings. Aside from a number of comments made about Tschoop’s health in the diaries and journals available for review on the Shekomeko Mahicans, the evidence in writing about Tschoop’s health is scanty at best. This may have been intentional, in order to follow the theme put out there by the prior Moravian which tried to present the reader with an image of Tschoop as a drunkard in need of salvation. In Loskiel’s book History of the Mission of the United Brethren among the Indians in North America (Translated from the German by Christian Ignatius La Trobe. London: Printed for the Brethren’s Society for the Furtherance of the Gospel), published in 1794, Tschoop’s physical description was also briefly referred to (p. 21), followed by a Christian metaphorical discussion on Tschoop’s condition and transition in life–the symbolic transition of one’s state from that of a wild bear to that of the lamb of God. 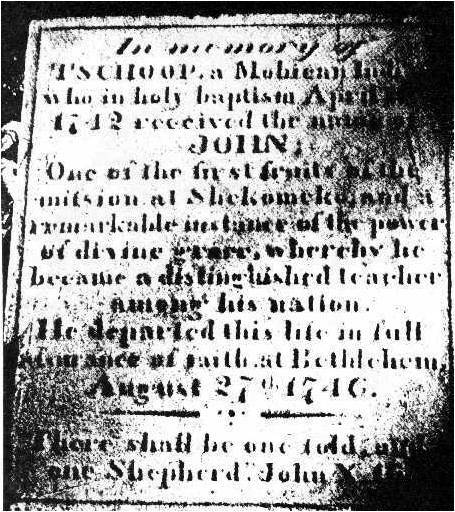 The later retellings of the Moravian Shekomeko missions story, as part of the dedication of the new Shekomeko monument site in 1859 provide us with a little more documentation about John’s medical condition. We are provided with the best experience for John’s health in the paintings of him with Jesus and the stories told about his missionary work on the streets by travellers and visitors of the missions. Numerous times, Tschoop, or John, made his way through the woods to other Moravian settings, sharing with the neophytes his experiences and life story as a Mahican, turned Christian Indian. The history of the Moravian missions tells us that he frequented two or more settlements in the immediate vicinity along what is now the New York-Connecticut border, meeting up with Native groups residing in Pachgatgoch, near what is now Kent, Ct., where the Schaghticoke group of Mahican-Algonkins resided, and another group located close to this current interstate border adjacent to a lake just west of what is now Sharon, Ct. [Wechquadnach on the map]. The most difficult route for Tschoop to have taken would have been from Shekomeko to Bethlehem. 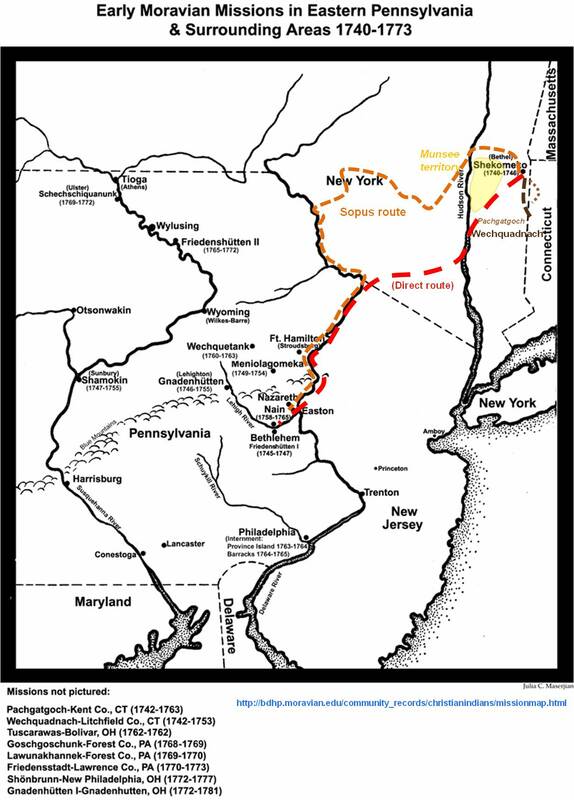 Fifty years earlier, they might have been able to take a direct route by following the Wappingi creek watershed through Dutch territory owned by the Van Kleecks and from there directly across what is now the Orange County region towards Pennsylvania and then Bethlehem. This route was no longer possible due to settlements, and so they travelled westward across Munsee occupied territory near what is now Bull’s Head Road or just north of this route across Upper Red Hook, across the Hudson River towards the “Sopus” (Esopus) Creek. This creek could then be followed like a maze directing you through the “Blue Mountains” or Catskills, to any of the major branches that leads travelers back towards Bethlehem. While travelling to Shekomeko, Spandenberg picked up a justice of the peace at Millerton, “about four miles from Shekomeko.” This justice stated his dissatisfaction with having to engage in this trip, adding he would rather have his right hand cut off than treat the Brethren conformably. This action of taking sides with the converted Indians was very much against his personal and professional beliefs. Bishop Spangenberg inquired into the experience and circumstances for each of the Mahican Christians. He then encouraged them to remain faithful to the Lord, and to firmly believe that this Lord would not forsake them. Spandenberg found much reason to rejoice over this congregation. For the first time he and others believed in the declarations they we reading about these converted Christian Indians. Spandenberg was not the only one to commend this change in Indian practices, and to the importance of John in making these events happen. In Chapter 3 of Loskiel’s work (page 53), we find that Conrad Weisner was also influenced by John during his pass through this village. On his way to from one Iroquois settlement to another, accompanying Brother Pyrlaeus and his wife traveling to their next congregation place, they passed by Shekomeko. Weisner then made his way to Shekomeko to see Brother Buettner. Taken very ill, Buettner was not around when Weisner arrived. But since Weisner had a thorough knowledge of these Indians and their language, he paid close attention to them, observing their behaviors and words. After contemplating this for a brief while, he no longer doubted the possibility that they were converted. This was especially made clear to him by an experience he had with John. The Indians at Shekomeko watched their fate change as their quarters changed from being bark houses to bark and brick homesteads, and their food gathering lifestyle transformed from a traditional hunting and gathering lifestyle to a living pattern more often associated with the pastoral setting as described in the Bible. Religion has always been reviewed in the medical literature when it comes to how this belief process influences individual and population health. Religion is more often discussed in the medical literature due to what has been term a “crowd” effect, in which numbers of people in close association with each other become in the same type of mystical or spiritual event. Activities such as speaking in tongues, and the holding of poisonous snakes without fear of being bitten by “the serpent” are to common examples of this in modern rural church settings. Although these two healing events may not have been practiced in the Moravian church setting, we know from various other writings that such mystical or spiritual healing practices as the laying on of hands would have been practiced at this church. Accompanying a laying on of hands event might have been church hymns along with some traditional Mahican words of prayer or musical sounds. The studies of cults exclude Moravianism from being any form of Christian religious practice. The practice of mysticism by Catholics and Mahicans alike made the Mahican philosophy very much like the philosophy of many of the saints linked to Catholicism. Unlike the Jesuits working just a hundred miles north of the Shekomeko mission, the Moravians did not miss this important part of any Mahican sacred practices. The Moravians learned in natural philosophy were very much familiar with the matching beliefs of the Mahicans. What is left to be understood is how did a small group of Indians get converted in just a few years, converted quickly enough to enable missionary leaders to change them from wilderness-dependent woodlands people, to a much less mobile farming community? The events occurring in association with the Shekomeko experience is what forced these changes along their way. The Mahicans at this site had to endure these changes in just a few years. The baptisms of newborn children, the experiences of epidemics, the loss of local sacred places and hunting privileges all added to this change in life that was occurring due to the migration of new settlers to the New York region during the mid-1700s. Throughout all of this, John kept his small communal setting of people together. Partially disabled by his health, he nevertheless managed to maintain his role as a leader of this group. John’s physical health may have been limiting at times, but for much of his life experience he remained sound in terms of his mental, psychological and biopsychological health. Psychosocially, his purpose in the minds of his people remained intact.